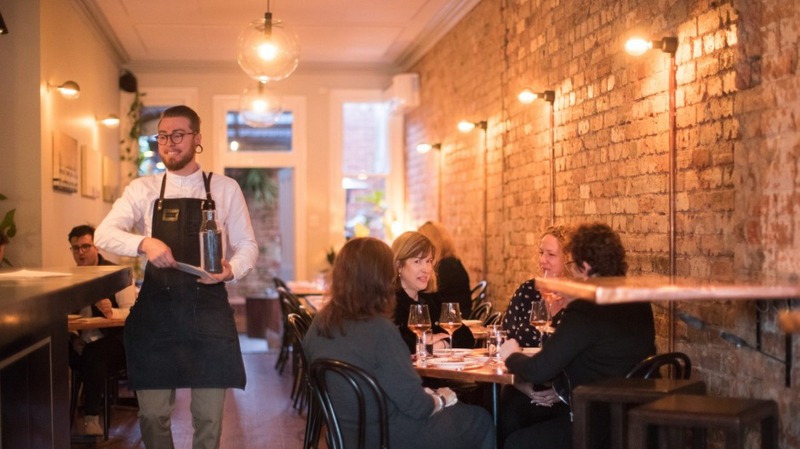 There's an important metric of success for a neighbourhood wine bar. If visitors from afar fantasise about moving within walking distance, then it's on song. Henry Sugar sails through the "real estate dreams" test: it welcomes and satisfies in such a way that you want to return, preferably on foot. As a pedestrian patron, you may try a cocktail or two, plus wine that's so interesting you can convince yourself drinking is viticultural exploration, not simple quaffing. Henry Sugar, well into its second year, is named after the troubled clairvoyant in a Roald Dahl story, but also points to an original notion to open as a dessert bar. Chef and co-owner Mike Baker has mostly worked as a pastry chef, including at El Celler de Can Roca, the Spanish restaurant that floats near the top of "world's best restaurant" lists. His business partner Daniel Mason (ex-Cookie, Joe Taylor) is big on drinks and cheer. As their vision developed they thought a rounded wine bar would work better than a dessert destination. It was a good decision. They offer one of the city's best value degustations ($65) or you can pick your own path through the shareable menu. It's big on seasonal veg with boutique meats sourced from small-scale farmers, like Warialda beef, who bring their grass-fed porterhouse to the door. 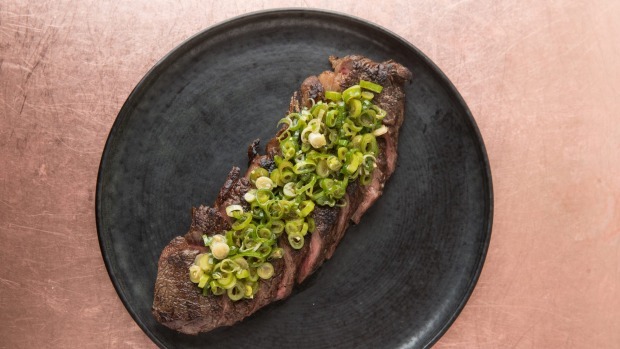 Most food – including that steak – is cooked over charcoal but Baker also prepares dishes at the central bar, plucking herbs from a pot on the bench, adding to the conviviality of the cosy bricked room. The house spritz includes rhubarb liqueur and fermented orange soda (made in house) and comes with an olive ice-cream bite on the side. It's fancy and fun. Super snacking starts with salt-and-vinegar leaves, sometimes broccoli, sometimes beetroot, tempura-fried and dusted with freeze-dried vinegar. Feeling adventurous? Peanuts are tumbled with chilli-spiced crickets that are only scary until you start crunching on them. He's Baker by nature too, so don't miss the bread, a multigrain sourdough with shatter-crisp crust and fluffy interior. Flavoured butter is a feature: right now it's rich, salty peanut butter but you might luck onto charred leek or roast tomato. 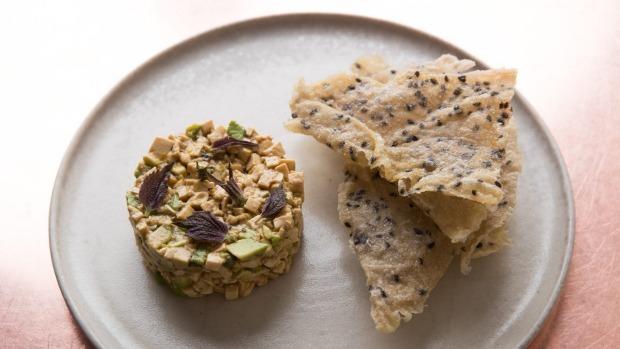 They don't make a big deal of vegan options but there are many incidentally plant-based dishes, including an excellent tofu tartare, which is such a good idea it's amazing it's not more common. Different types of tofu are meticulously minced and bound with avocado and sesame oil, then dressed with ponzu. Sesame-studded rice crackers are on hand to scoop it up. Cobia is a native, sustainably farmed fish that's served here brined, smoked and sliced. The result is tight, tender flesh, delicate and lightly oily. It's served with braised kohlrabi, a turnip-like root in the cabbage family. This is a curious pairing that eats inspired, the bitey sweetness of the vegetable providing subtle ballast, supporting the seafood and letting it star. Desserts are good, showing admirable restraint, especially as it's obvious Baker has tricks up his sleeve. The creme brulee is as classic as it gets but the chocolate mousse (vegan, by the way) is paired with whisky ice-cream and barley gel. It's simple, delicious and yet another reason to check local real estate listings.